Cuddly Coo is an adorable Ashton-Drake So Truly Real baby doll who coos when cuddled. CuddlyCoo is an adorable So Truly Real® baby doll with a magical touch—give her a gentle cuddle and listen to her start to coo! She is an Ashton-Drake exclusive by Sherry Miller, a renowned doll artist, loved and respected for her immense talent all over the world. CuddlyCoo not only feels real, but looks amazingly true to life. She’s fully poseable, with baby-soft RealTouch® skin and wisps of baby-fine hair.From her rosebud lips to her tiny feet, every detail is lifelike! At about 18 inches long, she’s the perfect size to hold close to your heart. And her gentle cooing will make you smile whenever you hear it! CuddlyCoo arrives in a cotton ribbed knit outfit that features an patterned shirt and polka-dot diaper cover, all with ribboned trim. Her snuggly grey knit sweater has pretty pink heart-shaped buttons. She even wears a bow headband in her hair for added sweetness. Requires 3AA batteries which are not included. 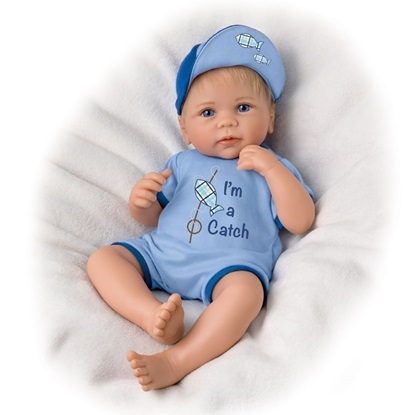 Rub-A-Dub-Dub is the first Ashton-Drake doll with RealTouch vinyl skin that is washable. This little guy is sure to make you fall in love hook, line and sinker! Sarah is beautiful in her custom knit sweater set. Her realistic wisps of hair on her little head and baby-soft skin, all add to her realistic real baby look.